When thinking about going away for the weekend or maybe even for a week, I would bet that Reading would probably not pop into your mind. Well keep on” reading” see what I did there? To see if this is the kind of place you would like to go. Located in the county of Berkshire, Reading is located around the A33 and as its down towards the south of the country heading that way will see you find the place without any major problems. Well we cannot talk about, Reading without of course mentioning the main reason so many people go there every August and that is the annually, Reading Festival which is regarded by many music lovers as the number one music festal in the UK each year. If you are not going there for the music festival, like most other UK towns they have more on during the summer months than they do in the winter, but there are some cool things like a neat little market that happen in the winter months. Well we have already mentioned that if you want to rock out with your……. Let’s just move on. But if music is your think you will want to go in August. But there are still some other pretty cool attractions for you guys who want to go for a short break. Here is a small sample of what, Reading has to offer. REME Museum of Technology, now this is not your typical museum. The focus here is about the Royal Electrical and Mechanical Engineers looking at the history from the early 1940’s to modern day. There is all kinds of cool stuff for you to check out here. And if you have kids the museum also has many interactive things that they can take part in as well. In all this is a really fun day out, even you miserable uncultured people who hate the thought of going to a museum will have fun here. Wellington Country Park, this is located just outside Reading, but it’s well worth the drive. This is just an amazing outdoor area with many different fun play areas for the kids that have all kinds of fun stuff like zip lines, slides, monkey bars and all other cool things they can break their arms on. There are many great areas where you can have a nice family picnic there is even a crazy golf course and an animal petting zoo as well. It’s pretty amazing how many fun attractions this park has. 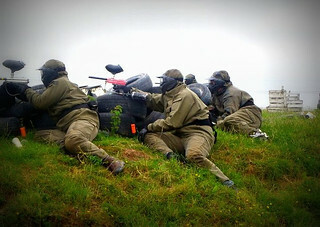 Delta Force Paintball, this has to be one of the best paintball places in the whole UK. Set on a private estate there are many different zones ranging from a castle to a haunted graveyard where you and your buddies can battle each other. If you have ever want to feel like you are in an action movie then you must go to Delta Force Paintball. As far as eating in Reading goes for a town of its size it has more than enough options to keep even the fussiest eater happy. Nice swanky restaurants and even fast food joins are a plenty. Reading has a number of popular night spots such as the popular, After Dark Club which is one of the town’s most popular night clubs. There are numerous other pubs and clubs for you to have a great night out at. Grosvenor Casino is a great place to go if you want to gamble all your problems away! If comedy is your thing then you will certainly want to check out the Highlight Comedy Club. They always have something going on so make sure you see who is performing on your stay.